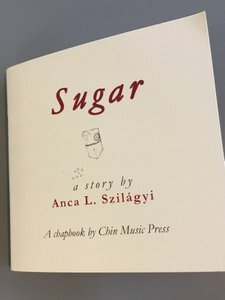 "Butter had bound them," Seattle author Anca L. Szilágyi writes in her new chapbook, Sugar. "A mutual love of butter." Sugar is a gastronomic love story about tastes and flavors and agreement and disagreement and all those other factors that make a relationship succeed or fail. I'd wager that pretty much everyone who has behaved ungenerously in a relationship can see themselves in the opening lines of the book: "He couldn’t stomach currants in his salad. She couldn’t stomach his not stomaching her currants." Set in and around Pike Place Market, Sugar is a kind of fairy tale, with food in place of magic. There are lamb's tongues and artichokes and lakes of butter and French food and other delectables that you can find in the Market. It's a delightful little amuse-bouche of a book, with an ending that will charm Seattleites and tourists alike. This Saturday, Szilágyi will read Sugar in the Pike Place Market at the showroom of the book's publisher, Chin Music Press. She'll be joined by Seattle poets Montreux Rotholtz and Alex Gallo-Brown, who is publishing an exciting new book at Chin Music next year. This is a great little showcase celebrating local writers and a local press and Pike Place Market itself. It doesn't get Seattlier than this. Chin Music Press Showroom, Pike Place Market, 380-1947, http://chinmusicpress.com, 3 pm, free.